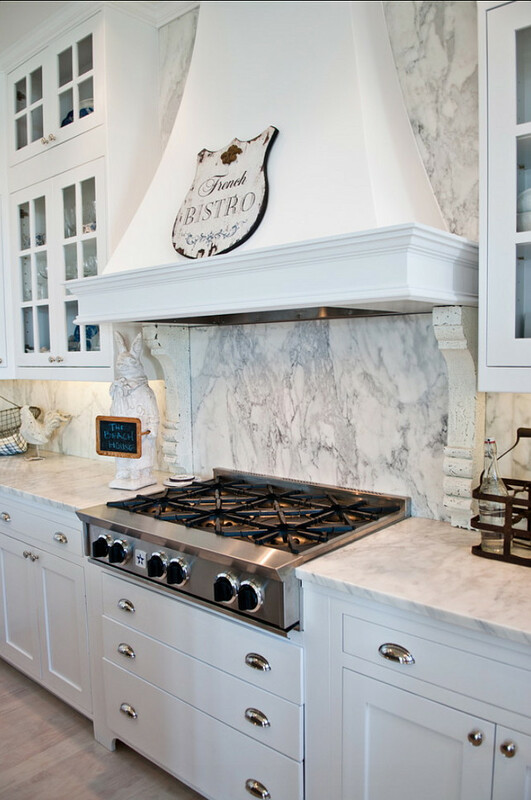 We see many classic white kitchens out there, but it’s hard to resist when we see a French white kitchen beautifully designed like this one. 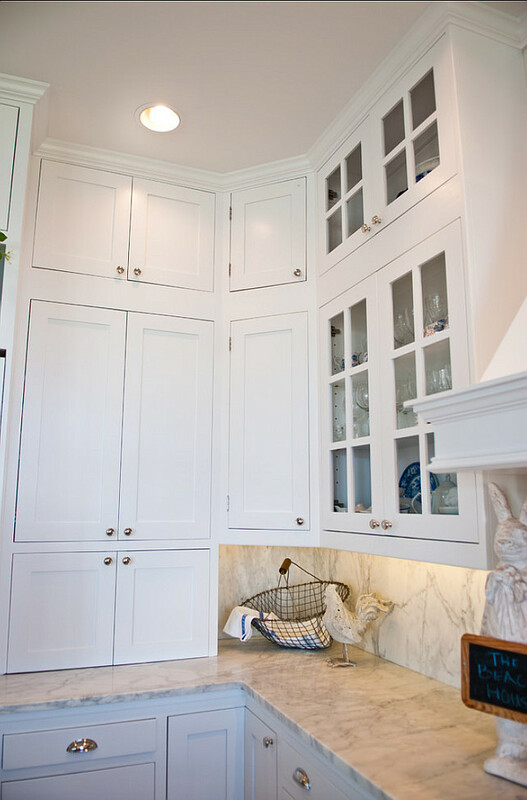 This French kitchen remodel was done by Kristi Spouse Interiors when the homeowners needed to refresh and renew their older kitchen to make a more practical space for their growing extended family. 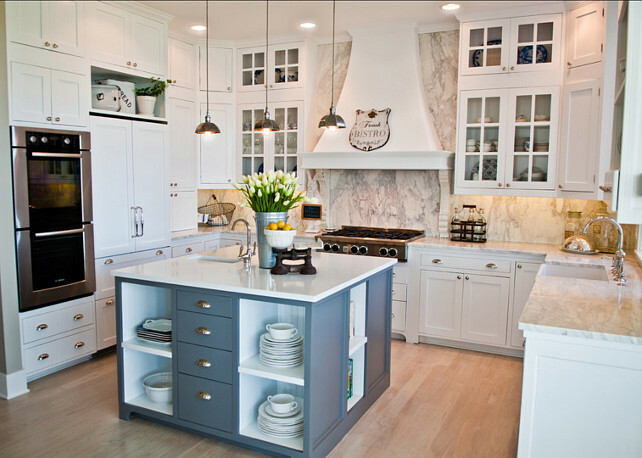 The designer suggested pure white cabinets with honed marble counters and backsplash for a clean and fresh look. 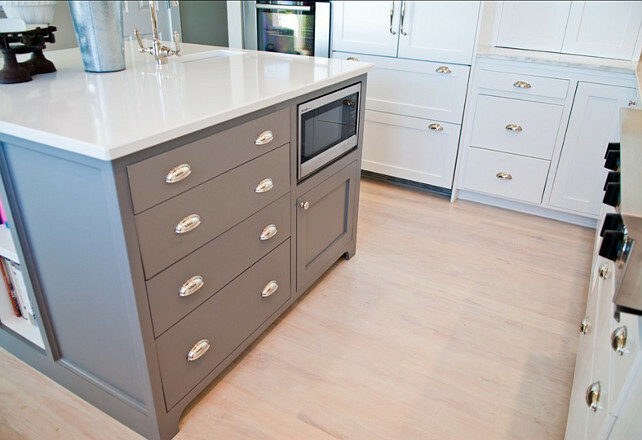 The work island offsets the all white kitchen with painted grey cabinets and a very practical white quartz counter. 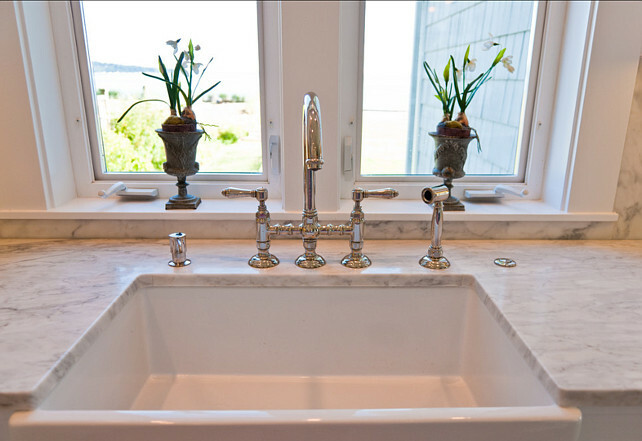 A fire clay apron sink and chrome hardware and faucets give the kitchen a timeless appeal. 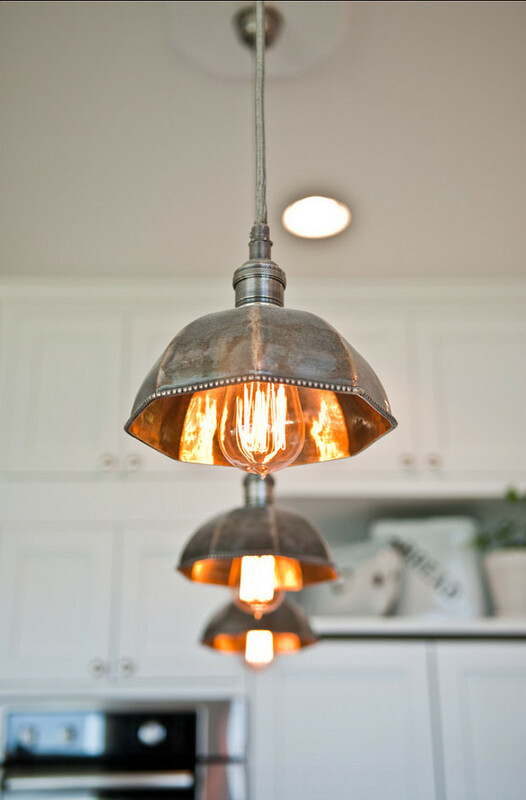 Antiqued nickel pendants fitted with Edison bulbs give the lighting a vintage feel. 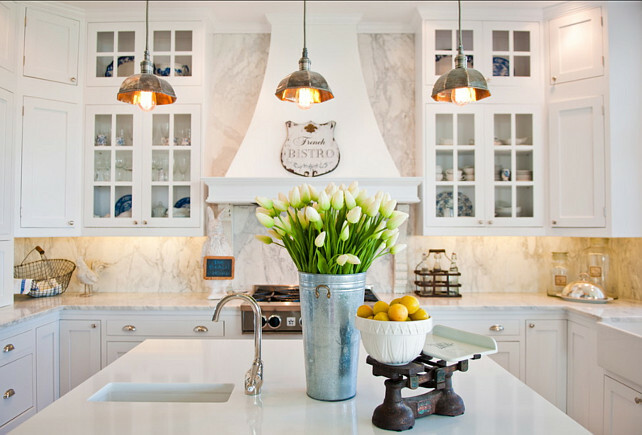 Take I look and you’ll see why I think this French kitchen bring white kitchen design to the next level! This French kitchen is serene yet full of special details. 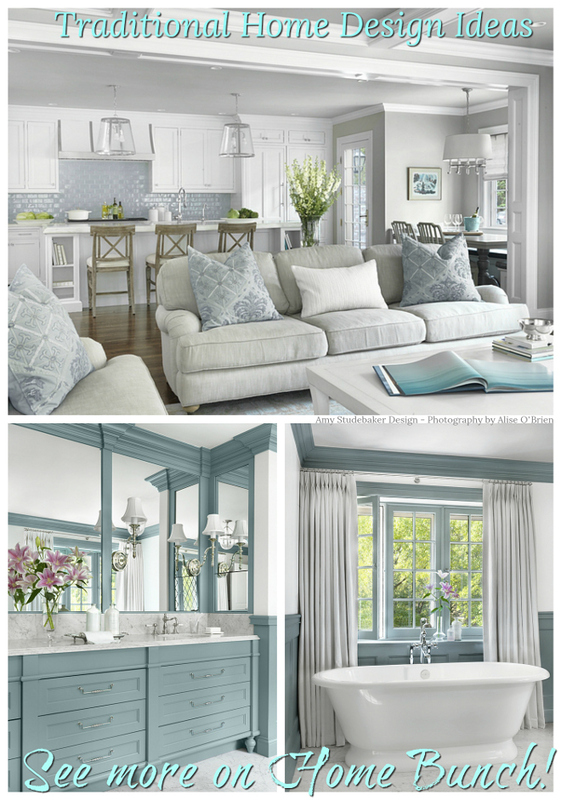 Wall Paint Color (seen on the 1st picture) is “Benjamin Moore 1535 Seattle Mist”. 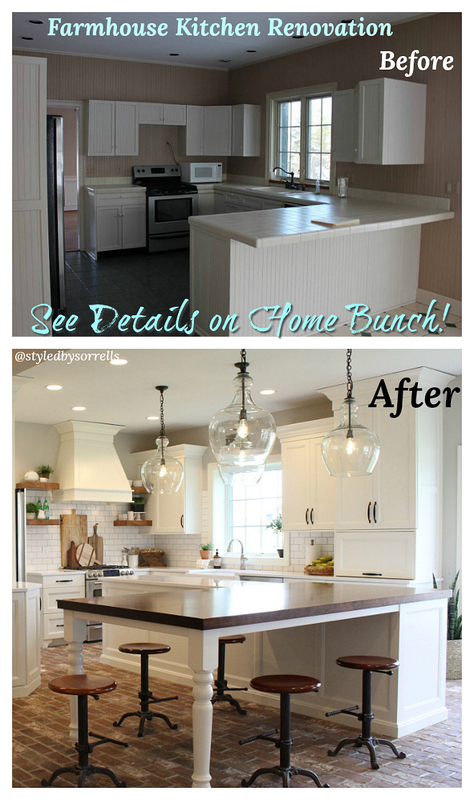 Kitchen Dimension: the kitchen is 10×15. 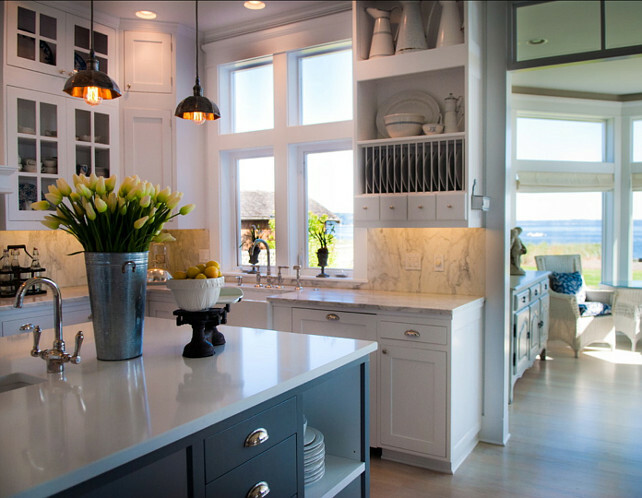 The island counter top is white quartz. The sides are Calcutta marble. 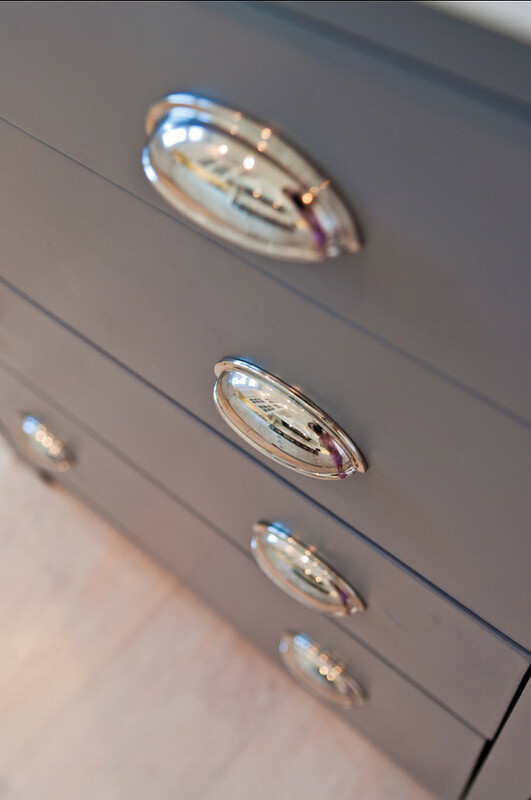 Gray Kitchen Island Paint Color: “Benjamin Moore 1603 Graphite”. The floors are Ash wood and the stain is Old Masters Wiping Stain — Light and beautiful! 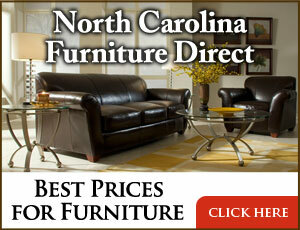 Besides, it doesn’t show dust as much as dark stained hardwood. Island Dimensions: This island is 60×60. Great size! 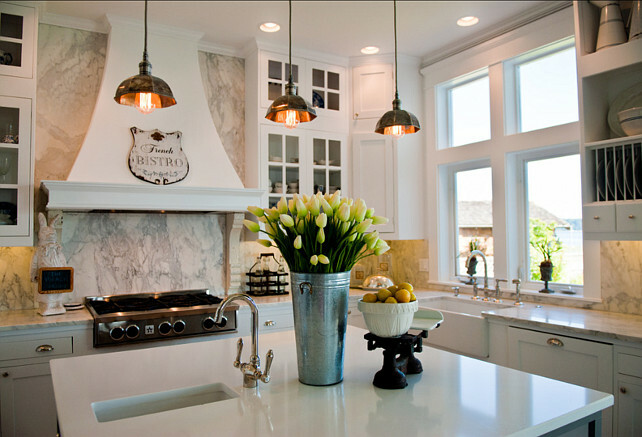 These gorgeous island pendants are vintage, but you can find similar ones on Rejuvenation. 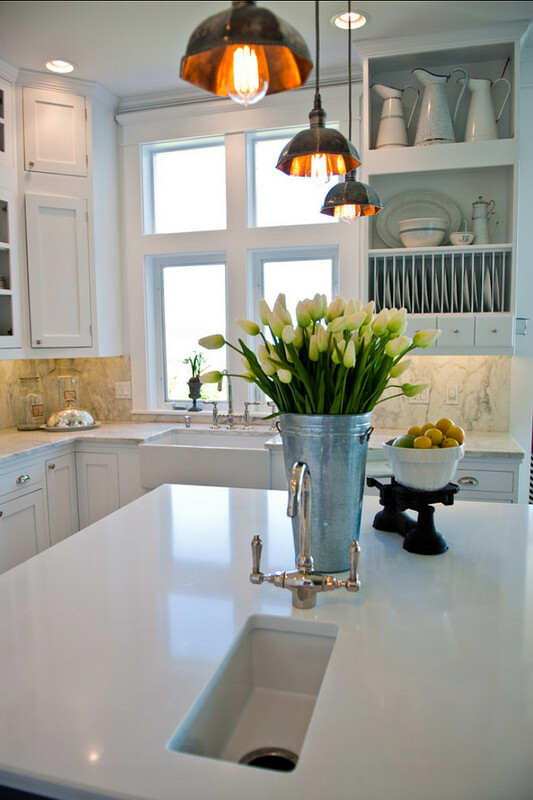 The countertop and backsplash in this kitchen are honed white marble. You notice it goes up to the ceiling, creating a more uniform look. 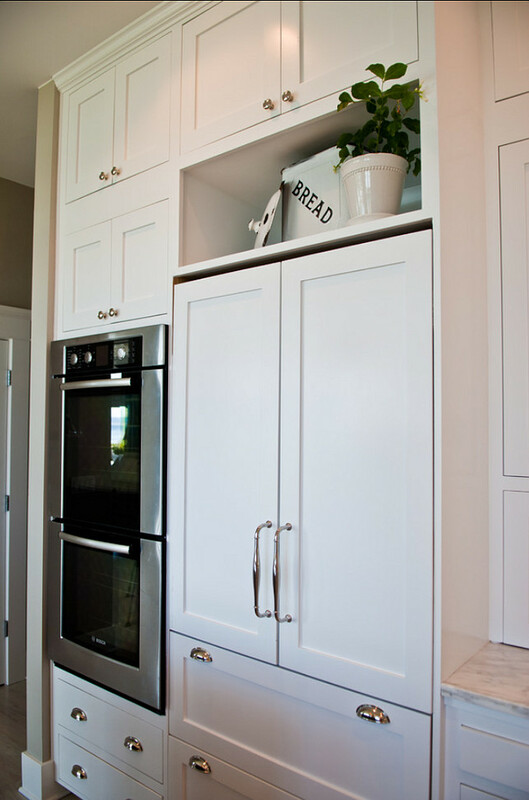 Also, note the drawers under the range. They’re great to store pots and pans. Handy idea! Range is a “BlueStar 48″ Rangetop”. 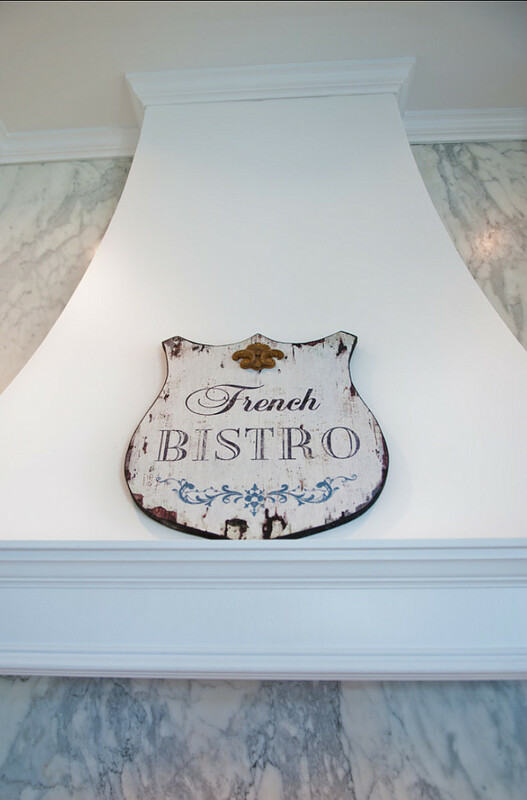 A French-inspired sign adds charm to the beautiful custom hood. These cabinets were very nicely designed. I like the fact they go up to the ceiling and vary in size. 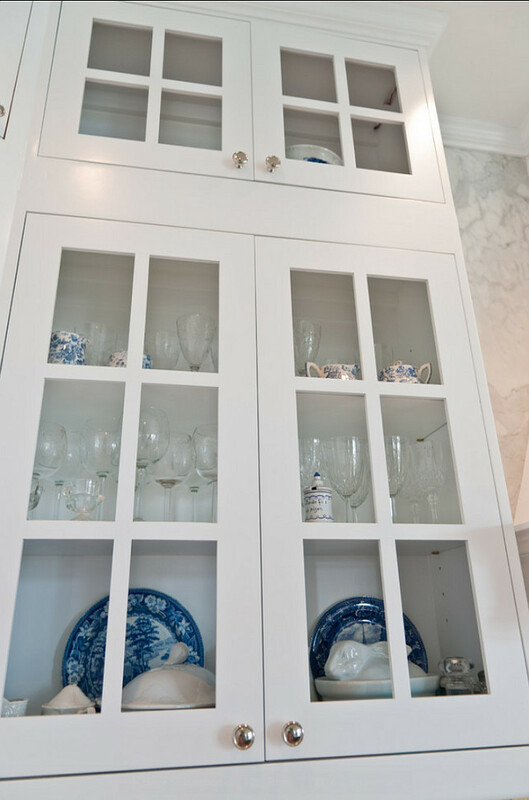 This created interest and different storage areas for this kitchen. Always display what you love! Fridge is a “Liebherr Premium Plus Series HC20”. What’s not to love in this kitchen? 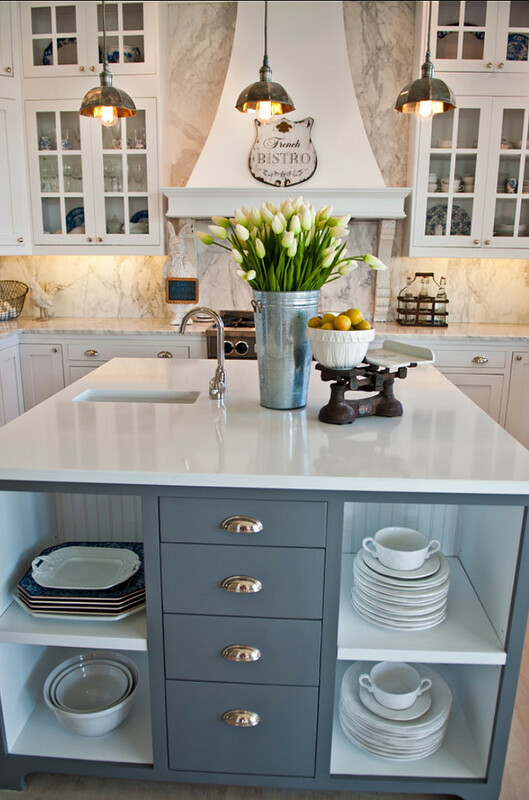 I really like the mix of materials found here, such as marble and the very durable white quartz island countertop. Also, note small prep sink. 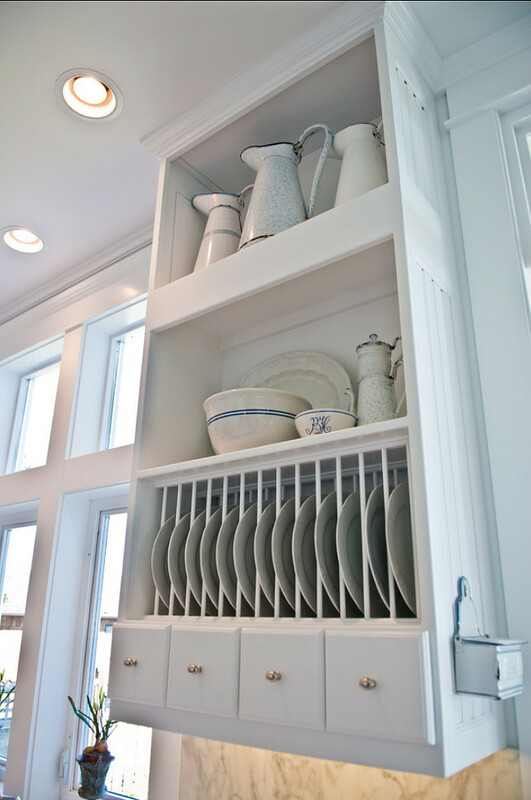 A plate rack adds a vintage charm to this French inspired kitchen. 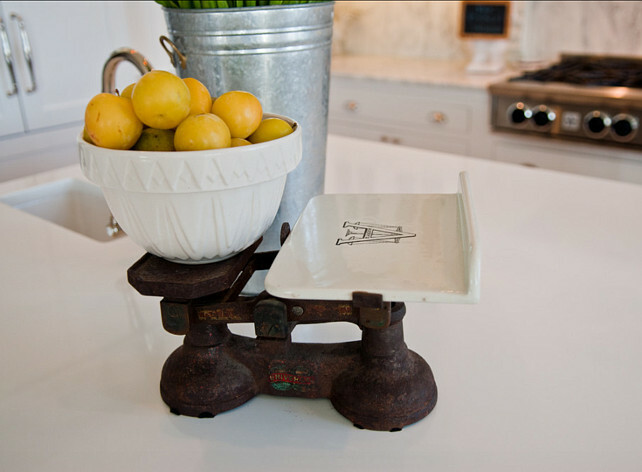 Patina is added with this cute antique scale. Actually, I have to say that I love antique scales and I am always trying to find them whenever I go to flea-markets! Washing the dishes here wouldn’t feel too bad, right? Bridge faucet is in chrome. 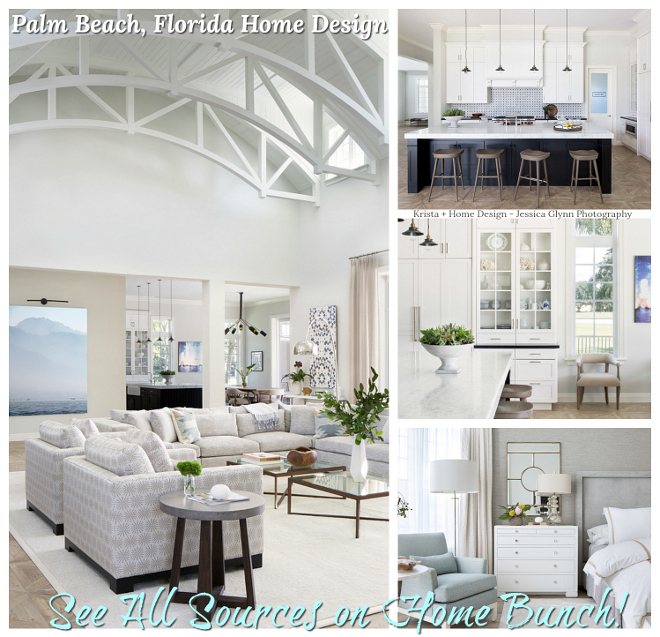 Source: Kristi Spouse Interiors – Images by Rebecca Anne Photography. Hi, everyone! I meant to publish this post last night, like I always do, but we had a very busy day and we came back home a little later than we expected. I have to say that there are many things changing in my life at this moment. The first thing is, like I mentioned last week, we have decided to sell our home. We lived here for many years now and even though we love it here, we feel we should live closer to the city. The kids are growing up fast and we feel we’re spending more time on the road that we want to. Besides, I feel this is the right time to start over in a new home. 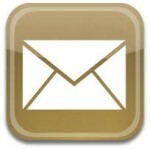 It’s was nice to know many of you are doing the same… I guess it’s that’s time of the year… isn’t it? Spring will come soon (I can’t wait for that!) and for many, like myself, it’s time to move on! I am feeling 100% ready for that! So, let’s cross our fingers and good luck to all of us! 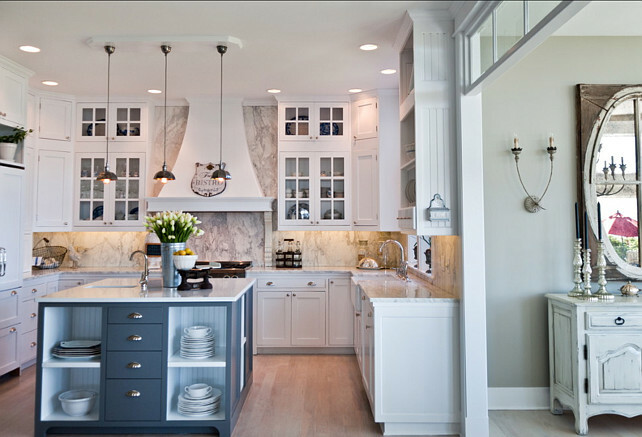 Oh Luciane, what a gorgeous kitchen. 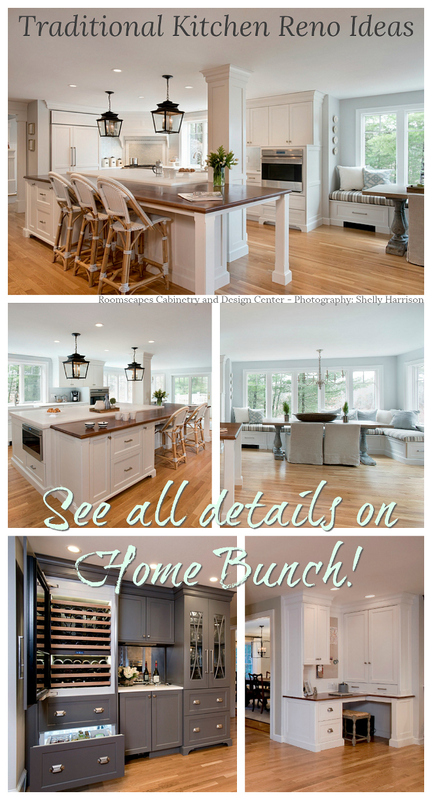 You know how we love a white kitchen and the gray island is amazing!! I know exactly how you feel Luciane. I am doing the same thing. While I have loved living out of town on 150 acres with my nearest neighbor over 1 km away, I am really looking forward to selling this home and building fresh only 5 minutes from work and town. We have the plans almost finished and I have been careful to make this house really reflect me. This has involved a lot of digging deep to uncover what are my life priorities, how I want to live and what things give me joy. I am going against the trend of having an open plan family room and kitchen because that is what I have had for the last 13 years and I haven’t liked it as much as all my other separate kitchens. Good luck with the house sale and to finding a home that reflects best who you are. 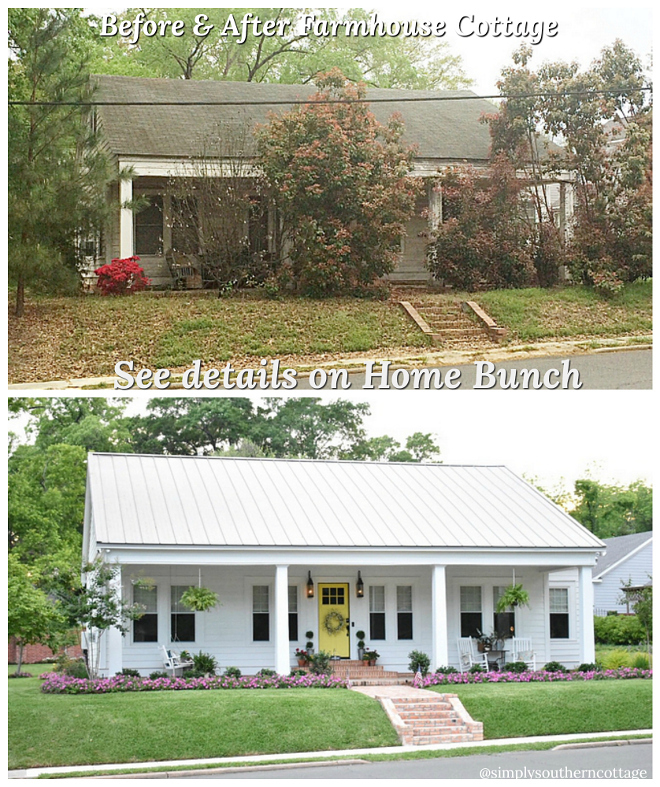 Good luck….everything will fall into place…always does….how fun to look for a new home! Thank you for sharing your thoughts about changing your place. I feel with you. We are living in a beautiful landscape with a big Garden, but far away from schools and everything we need. 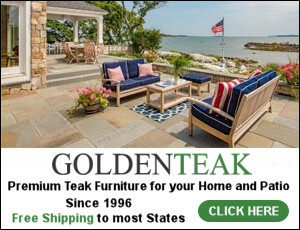 I was wondering the dimensions from island to countertop?